Pingdom used DoubleClick Ad Planner to mine demographic data in the United States and create an analysis of social network demographics across numerous social sites. The findings analyze data across Facebook, Twitter, LinkedIn, Pinterest, Tumblr, Reddit, Hacker News, Slashdot, Github, Stack, Overflow, Orkut, Quora, WordPress, Blogger, Flickr, MySpace, Tagged, Hi5, LiveJournal, Yelp, deviantART, StumbleUpon, Googdreads, and Last.fm. Google+ information was omitted from the study for lack of data accessible in the Google DoubleClick platform. Facebook and Twitter have the same gender user percentage, with 40% being male and 60% female. 26% are between 25 and 34; 35 to 44 make up 25%; 45 to 54, 19%; 18 to 24, 16%; 55 to 64, 6%; 0 to 17, 5%; and 65 and older, 2%. There are substantial differences in the age demographics of individual sites. 55% of tweeters are 35 and older, compared with 63% at Pinterest; 65% at Facebook; and 79% at LinkedIn. Some sites tend to attract younger uses. 58% of Reddit users are under 35, compared with 60% at Github, 63% at Hi5, 69% at both Hacker News and deviantART, and 83% at Orkut. The estimated age of the average social media user is under 37. LinkedIn supports the oldest user base, with the average age of 44, compared with Facebook at almost 51 years old and Twitter at 37 years old. 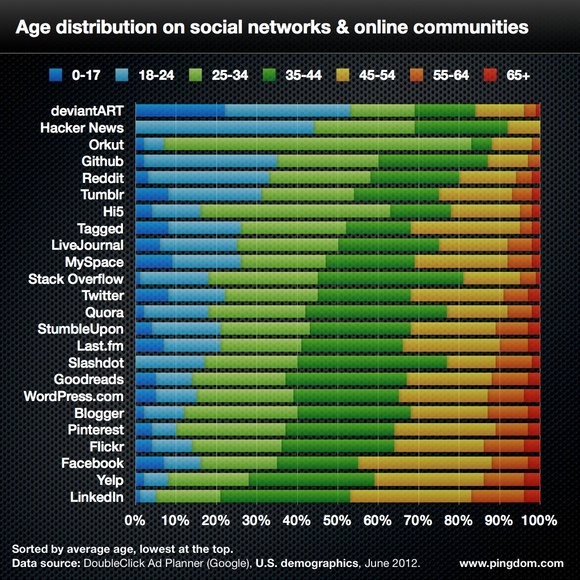 Interesting, how the use of social media sites differs among various generations. I wish they’d included Instagram because I would have loved to see the age stats on that.